The Granby Ranch Metropolitan District is governed by a board of five directors who serve staggered terms. 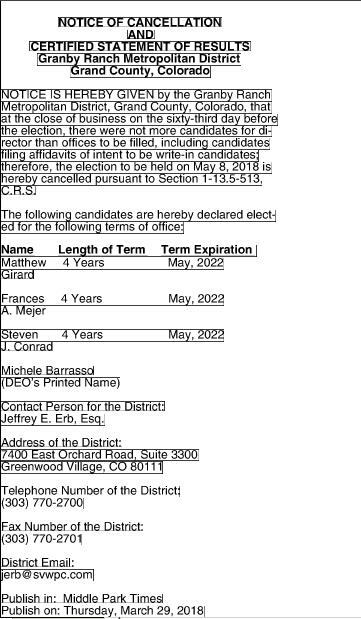 The members of the Board of Directors as well as their term expiration dates are shown below. The next election is scheduled in May, 2020. Please contact Michele Barrasso at 303-770-2700 or mbarrasso@svmp.com for more information. Regular meetings of the Granby Ranch Metropolitan District are now held on the second Friday of February, May, August and November and begin at 10:00 a.m. Meeting announcements, agendas and minutes can be found on the Meeting tab above. If you would like to receive meeting agendas electronically, email Jordan Honea at Email: jordan.honea@claconnect.com.